Human nature, throughout evolution, has always tended to shy away from uncertainty, favouring instead grounded and stable situations. As cavemen our survival chances were greatly increased if we didn’t spend needless time running around unfamiliar forests and instead found a stable and safe place to raise our offspring. Uncertainty was something that one tried to minimise. Even today, it is widely accepted that the life to strive towards is one of certainty, settling into a suburban house, marrying a stable partner, having a stable job to pay off your mortgage and slowly contributing to that pension you can one day collect when you are old to go sip cocktails on a beach for the rest of your days. For me to suggest attempting to live a life opposite to certain then seems frankly a bit ludicrous. Even to suggest embracing the very thing we are programmed to fear also seems nonsensical. However, before you count me out as a madman (and frankly I’m not particularly sure of my own sanity), let me give my reasons why not only learning to live with uncertainty, but actively seeking it out, could be a pathway to better success and more opportunities. Firstly we should take a look at what it means to live in a state of uncertainty. I am not talking here about struggling to know where your next meal might be coming from, because whilst sadly a lot of the world’s population has to live with uncertainty of that kind, it is not the type of uncertainty that thrives opportunity. But consider having the very basic needs for survival taken care of; food, water and the ability to rest with a roof over your head. After such needs are met, the further stages are of differing levels of success. Success with relationships, wealth, power, accomplishment, esteem. These successes often require work and time to be realised. However, one often overlooked fact is where it is we settle once we do realise our successes. When we have none of these opportunities our instinct is to be hungry for them, hunt out and find them and once found to work tirelessly to achieve them. However once achieved most people rarely look to re-ignite their opportunistic spark. This is why most people settle in long-term jobs that stop incentivising them, or in relationships which may have run their time, or settle for having some small influence over a small group of people. At these stages you may feel like you have reached your most optimal state and any sideways movement might look to make that state worse. So you settle into this certainty. But what if you could see this as a bigger picture. And this bigger picture would show you that there is, in fact, more opportunity to be had. 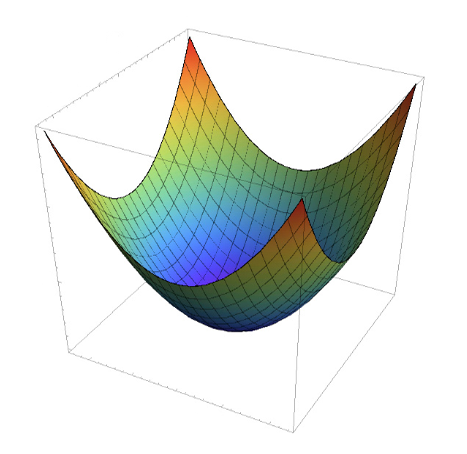 The above graph (Fig.1) shows the 3 dimensional illustration of the Rastrigin function. In mathematics this function is used to test if an algorithm one has made truly achieves its best performance. Performance is measured by how much the algorithm can minimise the function. In English this means how “low” the algorithm can get on the graph above. And as it happens this turns out to be a perfect analogy of the point I am trying to put across. See everybody starts somewhere and, like previously mentioned, works to get successful at whatever principles they might value. Just like the algorithm of the mathematician on the graph above we can define “getting successful” as trying to achieve the lowest possible state. By being narrowly focused on getting that success your most logical steps might seem to be following the most obvious path towards that success. Just like the most obvious path for the algorithm on the graph might just be to look around (from whatever point it is at) and then decide to take its next step in the lowest possible direction (down the hill if you will). Whilst this approach works for simple scenarios, something we shall call “local” scenarios, as can be seen in the simple graph (Fig.2) above, it is apparent to us, as the omniscient observers that this approach would end up stranding us when applied to the Rastrigin function (Fig.1) graph. In the global scenario we would carry on going down the hill until we could not reach any lower. At that point it would seem to us, observing from ground level and only being able to observe a couple of steps either side of us, as if we had reached the most optimal point, when in fact the overarching probability would be that we would just be on one of the local minimum valleys of the overall picture. And it is these local valleys that symbolise the states of blissful settlement most people end up in, when the truly best-state for success of whatever principle one might be applying this to actually lies somewhere else. One might now wonder how to avoid such pitfalls and take the path best suited towards the global best, or at the very least how can one can get out of these local valleys when one is stuck there? This is where we can refer back to our trusty mathematician for advice. 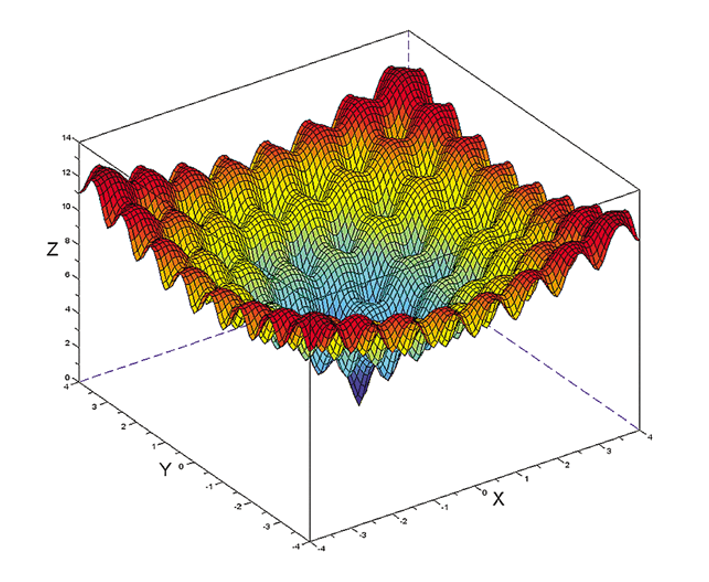 Whilst the field of mathematical optimisation is its own vast area of research and there is no one widely accepted answer to the solution (as the graphs / functions could become even more complicated than the Rastrigin function with new pitfalls) two of the most common and successful approaches to getting out of a local minima and not getting trapped into going own a local minima in the first place both use randomness and uncertainty. What if, instead of taking (what you think is) the most optimal path towards your goal by going down the steepest part of the hill all the time, you instead sprinkled a bit of uncertainty into the equation. At each step you would slowly work your way towards what seems like the most optimal path, but you would have some uncertainty of ending up in a place which might not be the most direct way to get there. As this progresses you might find a far better state of success than the one the initial path was guiding you towards. This I relate to being open to all new opportunities which might cross your path in the real world of life and occasionally letting yourself stray from the desired path for no reason other than curiosity and uncertainty. When you do this, you could find nothing, but you could also find a far better path in life. The second use of uncertainty comes when one is already trapped in a local minima. Instead of looking around and thinking “well, I have reached the best point I can, it’s only uphill on all sides of me so I shan’t bother looking any further” you should always be sceptical if you are actually in the best case scenario (most likely will be that you are not). With this scepticism one should explore, at random. A lot of the time this will mean exploring back up the hill at random points. This might mean looking at opportunities that seem below you, or areas which initially might not have gotten a second glance. But exploring with a healthy sense of uncertainty could end up taking you over a hidden ridge and onto new successes. One thing to realise is that in this analogy the complex graph such as the Rastrigin function exists many times over for many different areas of one’s life. One of these exists for your personal wealth, one exists for your relationships, another for your hobbies or life passions. And in each case the same techniques should be applied in an attempt to reach the global best, the global minimum of that value. It is easy to see the global best when you are an omniscient observer, blessed with all the information from the past and from the future to build into the model of life. But when you are that model, observing itself from inside itself the picture is much harder to interpret. With this viewpoint I hope you can take a new and hopefully optimised approach at navigating the complex model of life.